Signing up for selling games via Steam is easier now than ever before. Before Greenlight, Steam had an internal vetting process. You could get (and did get) turned down if your game did not seem promising enough. With Greenlight, you had to appeal to the public instead. Now with Steam Direct you can just give Steam info, pay the fee, and you are in. I just did that, and I found a few bits of the process somewhat confusing at first, so I thought I should share that with you, and maybe you can have an easier time. This is going to be different depending on which country you are in, what kind of company you have etc. I’m writing this from my perspective, and you can use the parts that are relevant to you. Our background is that we are a Swedish private company, i.e we have shares but are not openly traded. Bank Account Holder Name – The exact name of your company. Bank SWIFT Code – Should be listed on their homepage. Payee IBAN – The international form of your account number. Should be listed among the account info on the bank homepage. Otherwise, just call or e-mail them. Account Type – Checking or savings. It will probably be checking. Currency – USD. I don’t remember getting to choose a currency. Not sure I’d want to change it either. US citizens and corporations will need information similar to that found on form W-9. 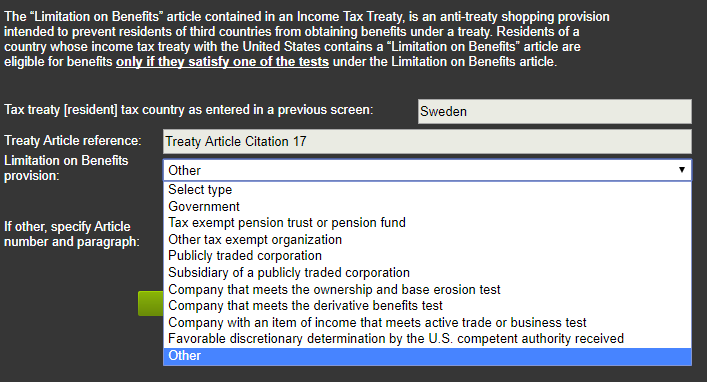 Citizens and corporations in a country with US tax treaty status will need information similar to that found on form W-8BEN. (Quote directly from Steam) Most of it is basic, like the name and address of your company, again. You’ll also need either a TIN (Taxpayer Identification Number) if you are from the US, or a foreign TIN of you are not. For me, the organization number for the company counts as a foreign TIN. So that was easy. Finding that out was not easy though. In the end, I e-mailed both the Swedish tax government (Skatteverket) and my bank contact to verify. The “Limitation on Benefits”. Not quite sure what I should choose here, or even exactly what it is, to be honest. If you click a help button here, they will link you to the definitions of the options. I’m pretty sure we could match two of them at least. So how do I know what to pick? Are there advantages to any of them? The derivative benefits choice will probably apply to lots of companies in the EU, so felt like a safe bet to me. After sending this in, they got back to me and requested a “Certificate of Incorporation or Registration details from Governing Authority which provides a summary of company registration, registered address and or members”. I simply sent them a Swedish version of my company registration. That worked fine. I did not get an e-mail back on that though, so I don’t know how fast I got verified. I just checked Steamworks one day, and it was done! There is also a fee. For now, it is 100 USD. That fee will be recouped after your game has sold more than 1000 USD though. Let’s hope it does that! Well, time to get started! Go to https://partner.steamgames.com/newpartner and your wildest dreams will come true! Well. Hopefully. Eventually. After a lot of hard work. But still! Another great blog post about releasing on Steam is this one by the developer of Cogmind.